MonoPulse Hi Fi Loudspeakers. Ultimate realism and sound-stage. - we intend to keep it that way. Contact - info@monopulse.co.uk or +44 7785 558238. MonoPulse speakers are custom made - so we ask for 50% with order, and the balance prior to shipment. We have many long-term friends and customers in Norway, so please make sure you contact us directly. Buyers have shared views in forums, hifisentralenforum and avforum-monopulse-heaven. We have no input to these sites. They are mainly in Norwegian, but most translators will work. Be warned, there are more than 1,000 MonoPulse postings. These are unsolicited. Countries include Portugal, Finland, New Zealand, Singapore, USA, China, France, Germany, Norway, Spain, Holland, Australia and Slovenia. "Hi Allan, Thank you for excellent speakers and outstanding service. It has been a pleasure buying from you. Perfect for me that likes the speed and timing so much. I have started to play old records we have not listened to in years, after the kids are in bed, instead of the usual zapping the channels of the TV all evening. "Everybody knows wanting to upgrade. I have now taken "3 steps back" from MUCH more expensive. I cannot remember relaxing as much and enjoying the music - with a system that cost the list price of the cables I used. This is the music pleasure I've been looking for. That Monopulse could deliver at its price is ridiculous indeed." Allan: “I have rediscovered some of the childlike joy of listening to music. Much thanks to your MonoPulse. It’s remarkable how the joy can appear out what seems like nowhere when the synergy of a system is right, regardless of price tag”. Thank you for making great speakers available at a cost normal people can afford. "Allan what can I say, the speakers are amazing. It's been worth the wait. Thank you once again Allan"
"A constant grin and almost a tear on some tracks. I was a musician for 35 years and strived to find hi-fi that would produce the timbres of different instruments, but speakers have always been the final let down - till now. I look forward to many happy listening hours, knowing my search for speakers is now over. Thank you for such a lovely musical experience." 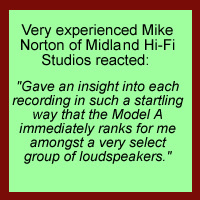 Neil W.
Neil directly purchased Model S speakers. "Just a quick note to let you know that the Model S speakers arrived safely and sound great! After using them for two days I am extremely impressed with the ease in which they present music - effortless! I am using them with a Musical Fidelity amp (X-150), Apple TV and Spotify via Airplay - its a truly impressive set up that gets right to the heart of the music. Congratulations for producing such fine speakers." Kevin McHale directly purchased Model A speakers.
" I am very pleased with my As. 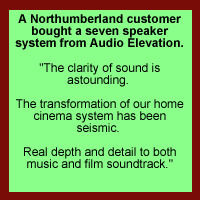 They are a very dynamic and lively sounding speaker, and make a very realistic and 'alive' sound with a huge amount of detail. The bass goes deep and they sound good at low and high volume. But they are not harsh or fatiguing. 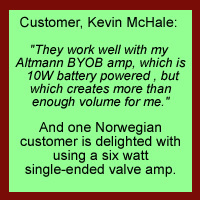 I particularly like the fact that they work well with my modestly powered Altmann BYOB amp, which is a 10W battery powered amp, but which creates more than enough volume for me through the As. A happy customer!" Russell Baston ordered two pairs of MonoPulse speakers – without hearing either. It was a pair of Model As for himself, and a pair of Model Ss for his father. I am discovering things, even not run in yet, there is a sense of ease and "rightness" to the sound that allows the equipment to disappear and just leave the music. Just one example re the accuracy of the speakers. I was listening to the SACD recording of the Mozart Requiem, by Deutsche Harmonia Mundi, conductor Nikolaus Harnoncourt, No.82876 58705 2, and I thought it sounded "odd", as if the choir was standing right up to the back of the orchestra. In the booklet it had a photo of the recording session, and where was the choir standing --. You were right about "no sub woofer needed". The bass is very pure, solid and clean but only there when it should be. My Dad is absolutely delighted with his speakers. He can listen for hours with no fatigue and is literally rediscovering most of his music. He does know a bit about it having been an organist and choirmaster for 20 years. The "room filling" abilities of such relatively small speakers is amazing! If you get any enquiries from people in my area I would be happy to give them a listen. Many Norwegians - and many pairs of MonoPulse hi-fi speakers. How Hans Kise bought one pair unauditioned - and his two friends heard them and ordered. The loudspeakers arrived Friday at 1430. Well ahead of scheduled. See pictures! Two Hi Fi friends came later to see and hear. They were impressed. I’m playing as much as I can using the classic Marantz. When listening to music, I use the tube amplifier. During my friends visit we also used a small single ended tube amplifier with only 5 watts. And a rebuild / modified GRAAF GM20 OTL amplifier. More later Allan. I’m enjoying the wonderful sound. Some members of Oslo Audio Society came to se me and listen to MonoPulse last Saturday. They were impressed! Really liked what they heard. We used both my 2 x 40W push pull amplifier and a small wonder using a single “rare” British tetrode (5B/255M) in a single ended configuration giving 6W output. Wonderful sound and enough power for the Model A.
I haven’t taken the time to experiment with placing the loudspeakers in different positions. It’s soon winter time and not so much to do outside the house. More time for HiFi! We delivered the latest restyled models, which they had not seen. They were in all black. The reaction? They are simply beautiful - very good work, thanks ! My girl did immediately state, "Yes, they are nicer than the old ones." I was a bit worried, but this is very nice - so the boss has accepted them already from pure looks. Also after about 2 min 40 sec out in the first song she commented on some instruments in the song she had not heard before. But I had them a bit to narrow spaced, I feel that they like to have a bit of distance between them. Now I have them a bit wider than my old speakers. They do deliver from the very first second a better defined sound than what I had before, "its more real". Sound is wider, with details that are focused/clean and easy to pickup/listen to. Also it feels like my tube amp don't struggle to control the sound, songs where the old speakers did get mushy in. The bass is firm now but still don't miss anything in the delivered sound pressure. All I can say is thanks, and for sure I will use lots of time to enjoy this new investment in life quality. I hope you have had a nice Easter-holiday. I have had a superb holiday listening to my new speakers!! The reaction from the original buyer? The Monopulse community in Norway almost exploded. It was trippled in a few days. I got a few photos from one of the new owners. He is so lucky with what he is hearing. So is everyone wisiting my place. Including the "hig end" members of Oslo Audio Society. What shall I tell when I'm asked about the price of the speakers? Will you continue to sell them on the same conditions as we got? Thank you for the sound and good music Allan. It was amazing - right out of the box - I'm so impressed with the deep bass these speakers deliver - tight, fast and very precise. And the same goes upwards the frequency scale. The soundstage is big. Brian Bromberg's Wood & Wood II are so realistic, you can hear the man drag his hand over the strings, knocks gently on the wood and there is that growl in the bottom. I have been using AKG K-501 and Sennheiser HD650 for more serious listening, and the MonoPulse speakers makes it so real in my listening room. Eva Cassidy, Steely Dan, Jamiroquai – you name it – they all sounds great. And the look stunning! My wife even likes them! I have shown her speakers from the last 6 editions of Stereophile, not a single one was approved based on their look. Yours are allowed to stay. I received the speakers today. You were right, the look and sound great! 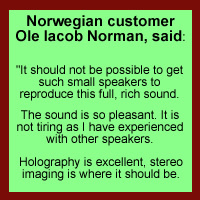 Many Norwegians have bought MonoPulse speakers, and the forum they have created now extends to many pages. After spending a couple of days in Denmark, the S twins was delivered to my private address. They where quickly installed and connected to my tiny tube amplifier and my old Thorens 150 record player. What a fantastic experience! They sounded clear and precise and the bass sound was perfectly balanced. I am very satisfied with your product, and my records have never sounded as pleasant as this before. Thank you very much! Best regards, Roy"
We will end with the original buyer 4 years on, upgrading to our latest Model A - and using a 6 watt single-ended amplifier! The Model A is really impressing myself and everyone coming in to listen. My push pull amplifier has been put aside for a while when the small 6W single ended is doing the job. The sounding is so beautiful and the low end is really present despite some people saying that this amplifier is missing bass. Many people are curious about what drivers you are using in the A. Can you share some secrets with us Allan? An American with a "small" apartment in New York. Ali Elim ordered a pair of MonoPulse Model Ss without having heard them. The speakers arrived tonight, a day early. In a word, I am thrilled: the bass is totally adequate despite the tiny boxes and the speakers have that rare ability to disappear and create a sound stage. Listening to the 1959 DECCA recording of Ruggiero Ricci playing Lalo's Symphonie Espagnole, but with no particular attention to placement (3m apart and about 3.5m from me) there was brilliant imaging. One day I have to visit you and you have to explain how that is accomplished. I have at least 20 pairs of speakers (including such oddities as Apogee ribbons, Acoustat electrostatics, JR149s, Celestions, '70s Gales with chrome end caps, even '70s self-amplified Philips motional feed back speakers) and very few accomplish that trick. "the living room alone is 3000 square feet. It is a testament to the speakers that they sound great in this large, reverberant space. I thought that you would want to know that I installed the speakers last night and was absolutely blown away by the imaging...it has completely transformed my system! Problem solved, packages delivered this morning. Packing was great, no harm, safe and sound. I checked speakers with my current system (Heybrook C2/P2, Marantz CD-17mk2, DIY CAT5e cables) and I was astonished by them. Wow. What a wide imaging they have! Very clear, nice sounding speakers. 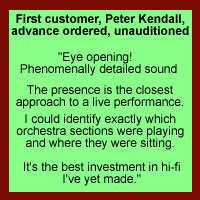 "hi Allan, i received the speakers a few days ago and i have to say, they are fantastic! The first to buy, unauditioned, was Chris, a technical author based in Stuttgart. Subject: Re: Order for a pair of Model S speakers. Just to let you know that the speakers arrived safe and sound early yesterday morning. Thank you for the unbelievably fast turnaround! I couldn't resist trying them out immediately, everything the same as with the old speakers. My first reaction, when I tried them with a piece of music that I know very well, I can only describe as absolute amazement! It sounded like a completely new piece of music. I had never heard base and drums so tight and clear! Needless to say, I spent the next couple of hours absolutely fascinated, trying all types of different music, before I could tear myself away to go and buy my new cables. Having finally set them up with new cables, I spent hours trying all the different types of music that I have: Classical, jazz, rock and heavy rock. All sound superb on these speakers...and this is still with my old Pioneer amp. So far, I can't fault them in any way. Basically they have complete transformed the listening experience. The bass and drums are so tight and clear, the whole mid range is so detailed that in some pieces of music I hear things I've never heard before, and the sound stage is tremendous. It's just like being at a live performance in some cases. And I still have to experiment with the height of the spikes, positioning, angles, etc. So far, it's all been without proper optimisation. This will be interesting. It was definitely the right decision to buy them! Thank you again for everything Allan. I'm absolutely delighted. Now I have to get some more music!! After that, and on Chris' verbal recommendation, his father John, in Southampton, also bought a pair of 62Ss unauditioned. This one is from an annoyed customer - at first. He'd been promised delivery on a Tuesday - and by the afternoon was phoning us. We said the delivery company had never failed a next day. But this time it was to fail. On Wednesday we traced the speakers to an Edinburgh depot - and got a promise of Thursday PM - and Mr Southall had taken up chasing personally - to find them in Cambridge. He phoned to demand that whoever in MonoPulse was responsible for the chaos was dealt with. We were worried about what frame of mind Mr Southall would be in when he came to judge these speakers. "Thanks for the loudspeakers which eventually arrived on the Friday. They are now run in - and listening to my collection has been taken to a new level of enjoyment. You have designed and manufactured a truly fantastic product - controlled yet detailed, truly holographic with excellent imagery and focus. All the family have been very impressed. Congratulations and I trust you will sell many pairs. Regards Chris Southall. You may use my reference if you like." P.S. The delivery problem was due to a wrong bar-code label put on by the carriers. A hi-fi professional buys unauditioned. But with some encouragement from Hi-Fi News. The review got my curiosity going so much I decided to take the plunge. I was feeling flush at the time so decided against all my wisdom (must demo a set first etc) to purchase a set without listening to them first. My risk paid off! I don’t usually do this. In fact I’ve auditioned carefully the rest of my system. But the MonoPulse 32 was everything I hoped for, and at the same time not what I had really expected. Clear, detailed, big soundstage, pace, dynamic and sweet. During the next week I played them and in the first fifty hours they really improved. I just keep playing them almost 24 hours a day. I listened to most of my collection. Put simply they restored my passion for music. A sound full of life energy and colour there was nothing sterile about them. I was so impressed! I suddenly had a full range speaker on my hands that would dig deep and go low but in a way that had life and texture to the bass. The top end extended forever and was sweet never at all bright or aggressive. The midrange on the S is full bodied and majors on timing and detail. I could go on and on using jargon and saying this and that, but basically the S restored my faith and passion in hi-fi. I have some silly priced speakers knocking around and a serious high end system and these show the competition a thing or two! I have nothing to gain in feeding back this whatsoever. Just thought I would share something that revived my passion. Subject: you bet you won't have any complaints about buying un auditioned!!!!! I should have done this before, but kept forgetting. Fu****g brilliant. There are so many things I could say. Nothing has the same clout!!! My system is now top notch beacuse of a pair of 32s. Every one who hears them are blown away, that includes b&w owners. I recently acquired a pair of your S speakers. First of all, these are excellent. I’m using them with a 35 wpc valve integrated (a Tube Technology Unisis) and I can honestly say that they do things that none of my previous speakers have managed. A good look at your website led me to try placing the speakers much further apart than is usual and this has worked very well indeed. I’m very impressed by how natural they sound (and by how much they make some pretty expensive competitors sound like ‘boom and tizz’ merchants). Imaging and soundstage are outstanding. Anyway, an excellent speaker – My understanding of loudspeaker design is fairly limited, but you have clearly got some very significant things right. The only criticism I can think of is that the treble (in my room and with my system) lacks a little sparkle and presence (note that I avoid the word ‘brightness’, which is a failing of too many speakers these days). I can’t fault the quality, but feel the need for a little more quantity. Do you have any tips that might help ameliorate this? A friend (who has rather more technical knowledge than I) suggested that if all else fails, a small adjustment to the crossovers would work. I’m not sure how you would feel about this, but if a little soldering and basic component replacement is all that would be required, then I have the expertise to hand….. Many thanks for your time and my congratulations on an excellent design. I wish you every success. We said OK - but check changes with us in case they could damage the HF unit or the amp - then. Many thanks. Good news – having sent the email yesterday, I decided to go back to basics and check everything in the system. The real revelation came when I changed the interconnects between my mc step up transformer (a recent addition) and the amplifier. This, as it turns out, is where the problem was. Best guess is some kind of impedance mismatch, which sucked away a lot of the HF. So no need for any DIY after all. Wow! Any thoughts of criticism have been thoroughly banished – they sound amazing. I have never heard an acoustic guitar so faithfully reproduced. My previous speakers were Linn Isobariks (curate’s egg – some considerable strengths and some irresolvable weaknesses), but the Ss outclass them in every way. I can’t tell you how pleased I am. Many thanks for your reply. Regards Martin." And he posted this on Hi-Fi Wigwam.
" Wow! Initial impressions were extremely positive - the first disc I played was a Spanish guitar recital. I was struck by how natural the guitar sounded and how easy it was to follow the intricate runs and subtle changes of rhythm. The guitarist was there in the room and the speakers had done a disappearing act. The subtle harmonics from the plucking of the strings were so clear that I found myself guessing how long the guitarist's fingernails were! Soundstaging and imaging are absolutely top drawer, far better than any of my previous speakers. The music seems to hang in the air in three dimensions - every little detail is easily followed has a definite place in the soundstage. Jazz fared equally well - 'Blues for Yolande' from 'Coleman Hawkins Meets Ben Webster' caught the growl of Hawk's sax perfectly and really brought out the contrasting, sweeter tone of Webster's instrument. This is a favourite track of mine (I always use it at demos of new kit) and I haven't heard it sound this good before. Female voices (from Angela Gheorghiu to Joni Mitchell, Janice Joplin and Billie Holiday) were handled with relish. Rock, pop, blues, folk, you name it - nothing tripped the speakers up. They really do seem to be all-rounders. There is something quite disarming about the sound of the Monopulses. I can't put my finger on it - they just sound right. The website talks about the drive units being 'in full impulse and time alignment'. I'm struggling to understand the finer technical points, but there is something in the theory - imaging, timing and a general sense of coherence are the order of the day. If you happen to be near a dealer who stocks Monopulse, I would recommend giving them a try. The fact that the 62A are such a good match with the Tube Tech bodes well for compatibility with other tube amps, I suspect, but in any case you won't need a powerhouse to drive them..... The 62A are no longer available in the UK, but the 42A has had some great reviews - If they are anything like as good as the 62A, then they will be worth investigating. I set them up in my system (Pathos classic 1 hybrid amp & BAT VK5D cd player). They seem to handle all types of music equally well. I am playing familiar cd's & I am amazed at how much better they sound. Even at the price of £900 new they are great value. I will recommend your speakers to any audiophile I know. Keep up the good work. Regards, Ian Berkoff." I am sending this note to say thanks. I have been running the Model S via exposure int amp +musical fidelity tube buffer + myryad cd player and the sound is outstanding. It is a week since the system is up and running.. I have listened to almost any type of music and the speakers are excellent throughout.